GIF is popular in our social media lives, but how do you make a GIF? Use GIF makers! 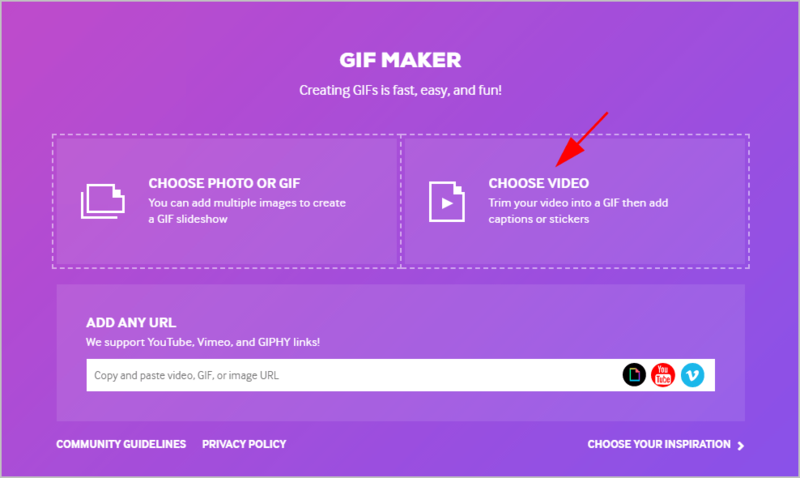 This post shows you how to make GIFs with GIF makers online, in your computers and mobile phones. If you make GIFs more often, you should use GIF makers in your computer. 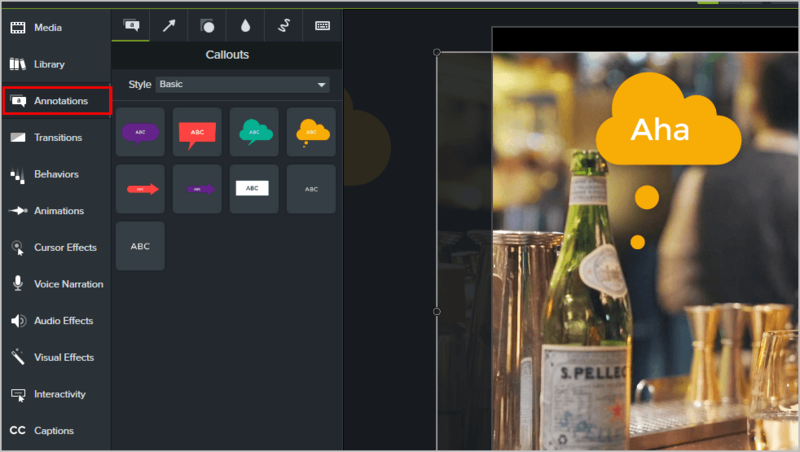 A powerful GIF-maker software will provide you with high-quality GIFs and more effects. 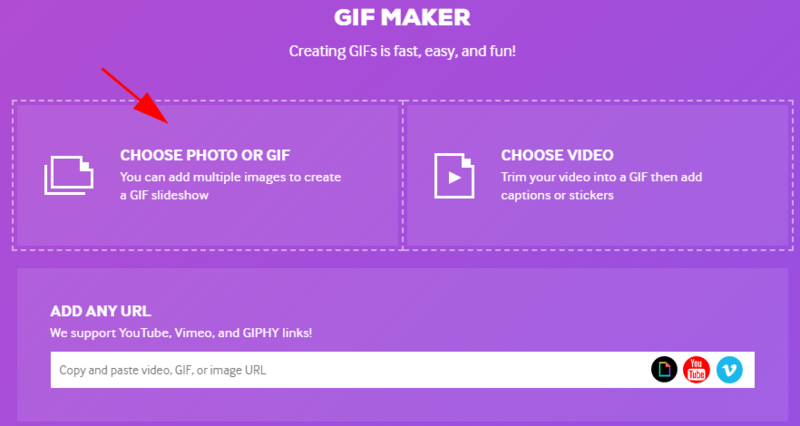 There are many GIF-maker tools and you can choose the one you like. 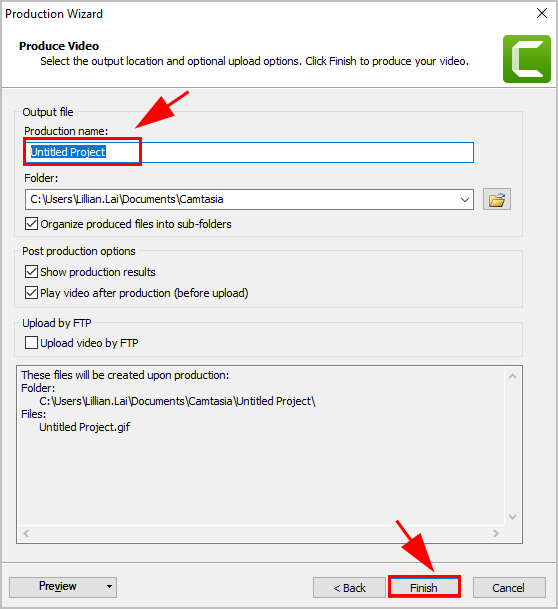 If you don’t have the time or patience, you can do it with Camtasia. 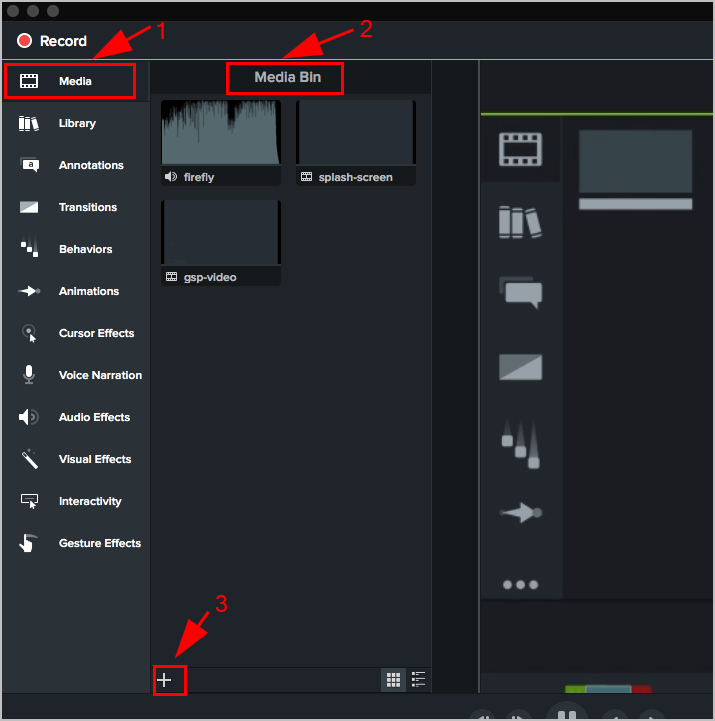 Camtasia is an all-in-one video editor with powerful features. 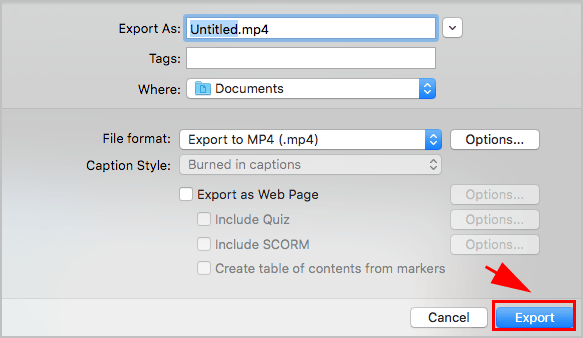 You can capture a screenshot or videos, you can edit your capture, and you can share your videos to FTP, YouTube, Dropbox, etc. 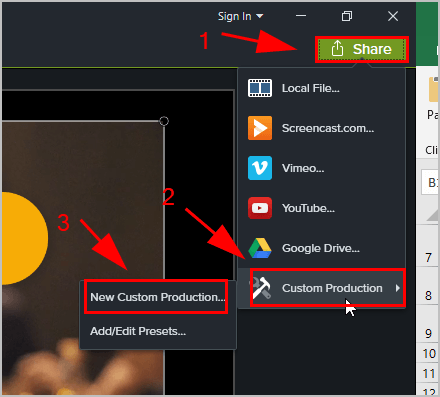 1) Download and install Camtasia in your computer. 2) Launch Camtasia and run. You’ll need to register for the first time to sign in. 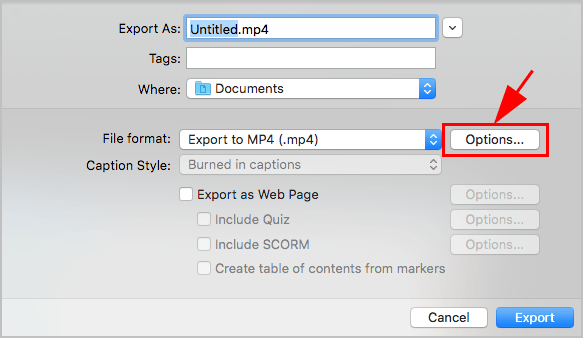 3) If you want to make GIF with images or videos in your computer, click Media > Media Bin > Import Media to upload your images or videos. Or you can click Record to capture a video on your screen to make your own video. Just click the Record button to start recording and press F10 on your keyboard to finish the record. 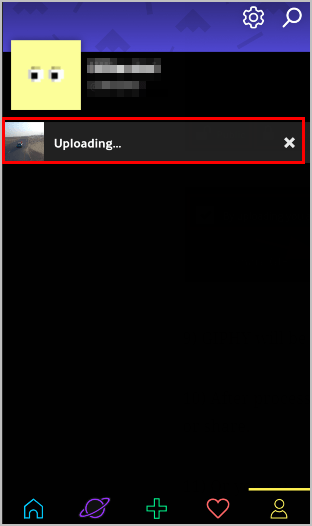 4) Drag and drop your selected images or videos to the pane. 5) Click and drag the red and green playhead handles to select the portion of the timeline if you need. 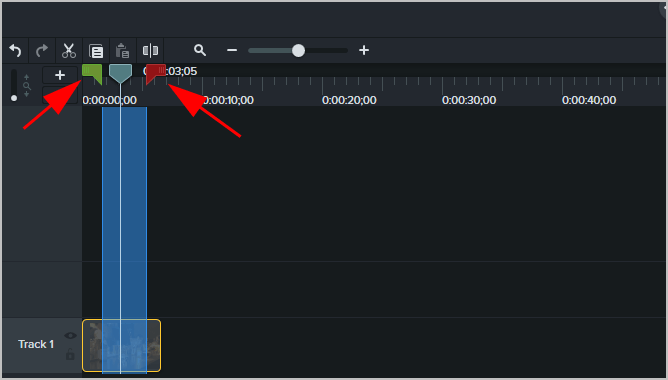 6) You can edit your videos or images as you like, such as adding annotations, transitions, behaviors, animations. 7) Once edited, click the Share button, and select Custom production settings. 8) Then choose GIF – animation file and click Next. 9) Check the encoding options (you can leave it as default), then click Next. You can click Preview to view your GIF. 10) Choose your File Size. You can leave it to select Current. Then click Next. 11) On the Product Video page, enter a name for your GIF file, and you choose where you want to save your GIF. Then click Finish. 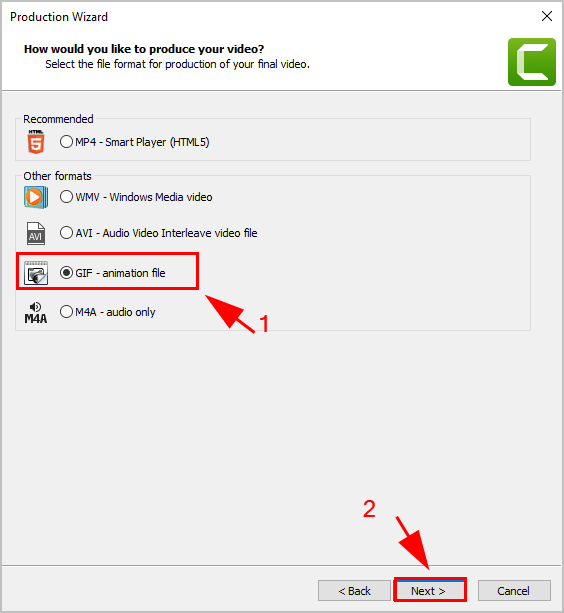 12) Click Next twice and Camtasia will creating the GIF for you. 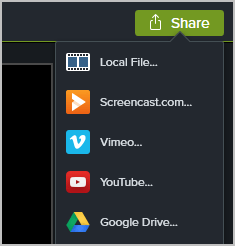 13) Back on the home page, you can click the Share button to share your GIF to YouTube, Vimeo, and more. 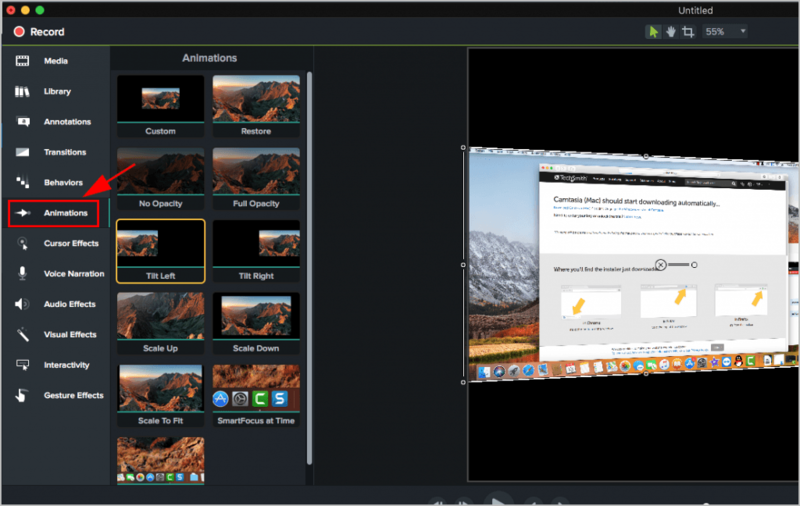 1) Download and install Camtasia in your Mac. 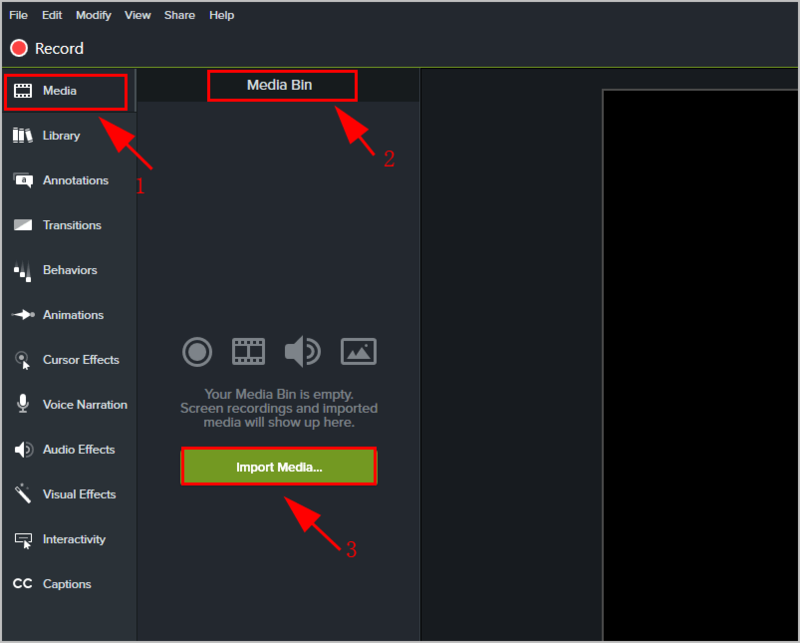 3) If you want to make GIF with images or videos in your computer, click Media from the menu on the left, then in the Media Bin, click the + button to upload your images or videos. 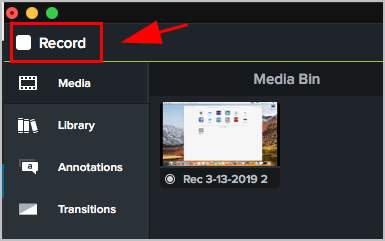 If you want to record a video in your Mac, click the Record button on the upper left. 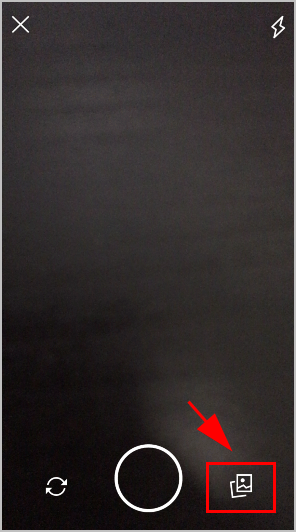 Tap Start Recording to record your video. 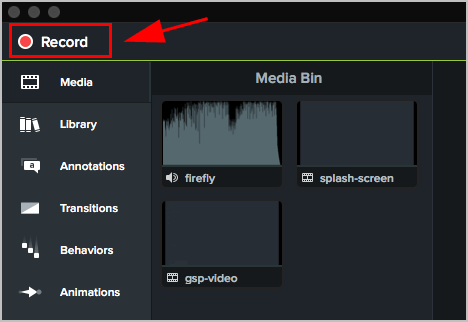 Tap the Record button again in Camtasia to end the record. 4) Choose your images or video to edit. 5) You can click and drag the red and green playhead handles to select the portion of the timeline you prefer. 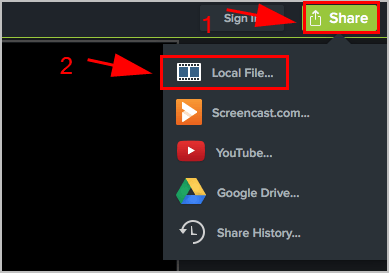 7) Once edited, click the Share button in Camtasia, and click Local File…. 8) Click Continue if you see “Do you want to export the current selection?“. 9) Rename the file name next to Export As, choose where you want to save the file to. 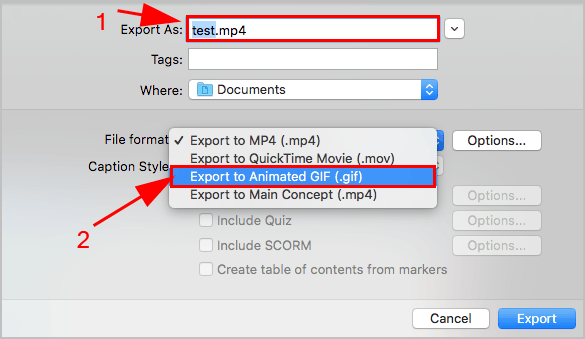 For File format, select Export to Animated GIF (.gif) in the drop-down menu. 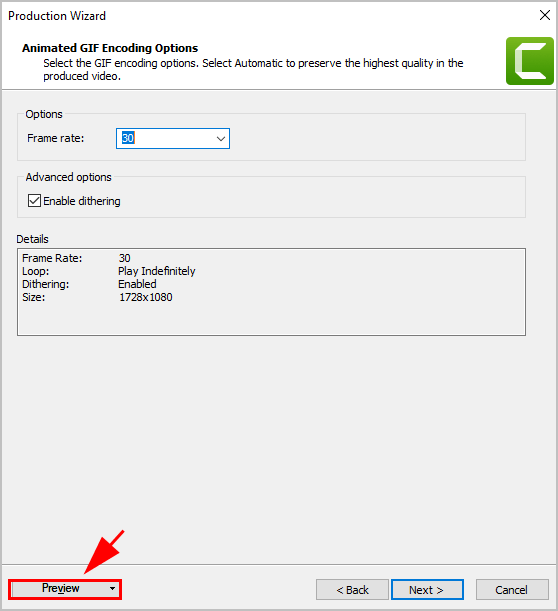 10) You can also click Options to edit Frame rate and Dimensions. This is easy, isn’t it?! 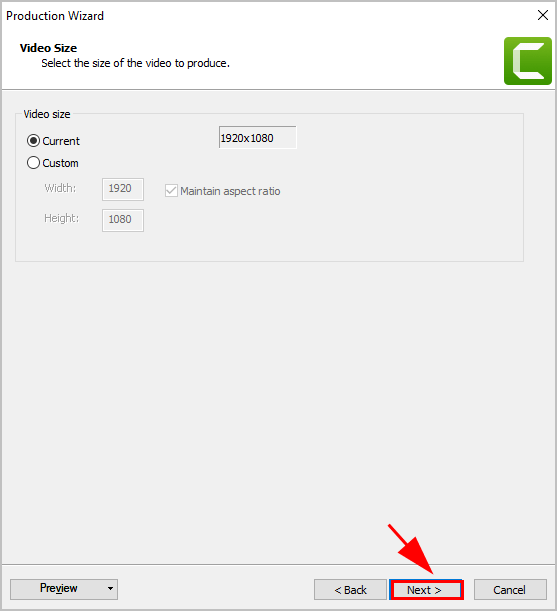 Camtasia makes your video editing lift so much easier! 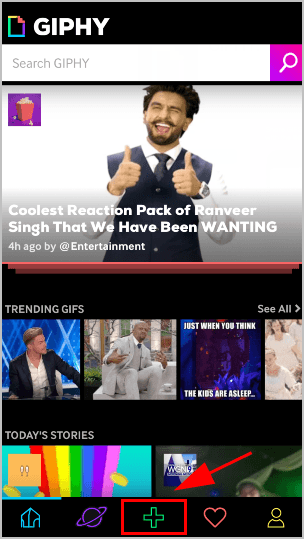 If you want to make GIFs from images or videos in your mobile devices, there are various GIF makers for mobile devices. If you’re not sure which one to use, try GIPHY. Note: the screenshots below come from iPhone. 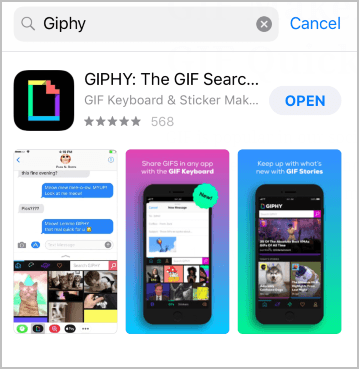 1) Open the application store in your mobile phone, and search for GIPHY. 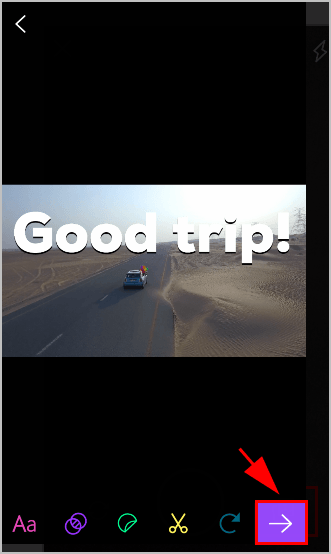 2) Download and install GIPHY for your device. 3) Open GIPHY in your device, and sign into your GIPHY account. 4) Tap the + button at the bottom to create GIF. Be sure to grant permissions. 5) Take your own pictures or video, or tap the camera roll icon on the right to select the pictures or videos in your album. 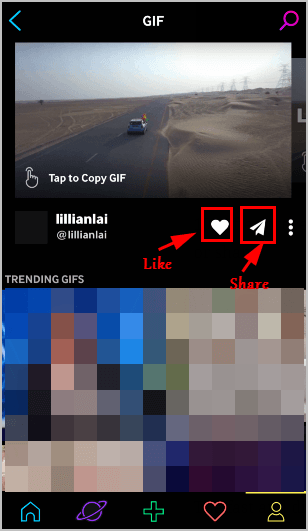 6) Tap the tool icons at the bottom to add features to your GIF, such as Caption, Filters, Stickers, Trim, and Loops. 7) After editing, tap the arrow icon to upload your GIIF. 8) You can choose your GIF to be Public or Private. Check the box next to By upgrading you agree to our Terms of Service. Then tap Upload to GIPHY. 9) GIPHY will be creating your GIF. 10) After processing, you’ll see your GIF on the screen. Tap your GIF to like or share. 11) Or you can tap the three dots to save it to camera roll. 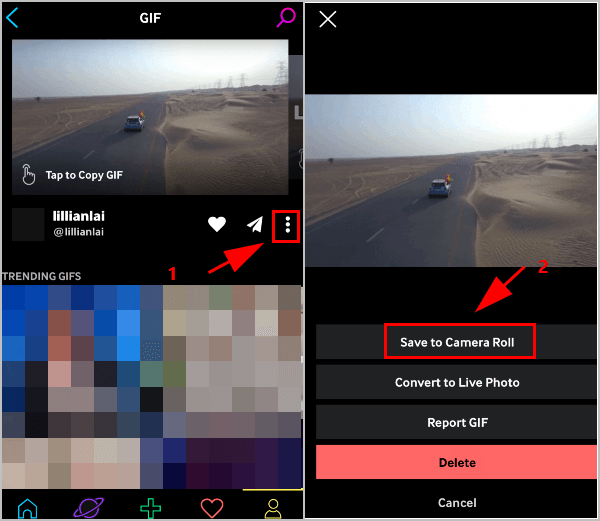 The fast and direct way to make GIFs is to do it online, which allows you to upload and make your GIFs without having to install the software. There are various GIF makers online. If you’re not sure which one to use, try GIPHY. 1) Go to https://giphy.com in your web browser. 2) Click Create on the top. 3) If you want to convert your images to GIF, click Choose Photo Or GIF. If you want to upload videos you already have, click Choose Video. If you want to convert to GIF from videos on websites, enter the URL under Add Any URL (YouTube, Vimeo, and Giphy links are supported). 4) Upload your images or videos. 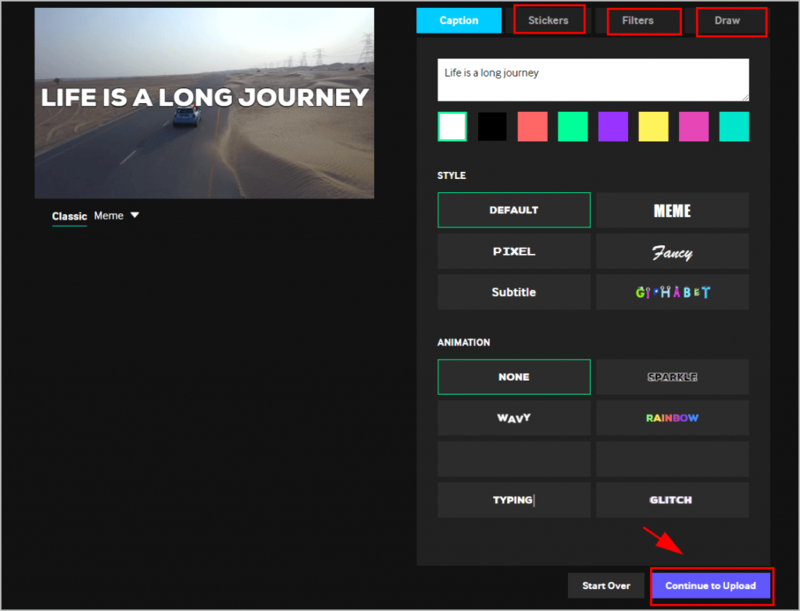 5) Use the slider to choose your video duration, and click Continue to Decorate. 6) Under the Caption tab, you can enter the text for the GIF caption, and select Style and Animation for the caption. And you can click the Stickers tab, Filters tab and Draw tab to customize your GIF. Then click Continue to Upload. 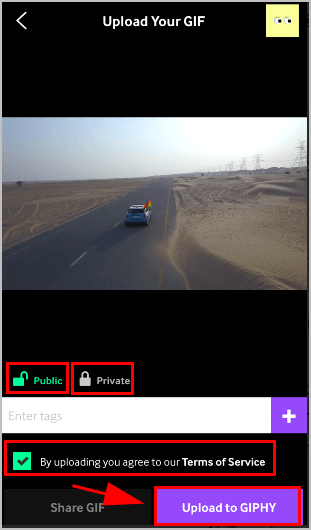 7) You can then add source URL and tag to your GIF, then click Upload to GIPHY. 8) GIPHY will create the GIF for you. You can copy the GIF link to save it, or share it to your Facebook, Twitter and other social media. Tadah, now enjoy your GIFs. So that’s it – three easy methods to make GIFs using GIF makers. If you have any questions, feel free to leave us a comment below.